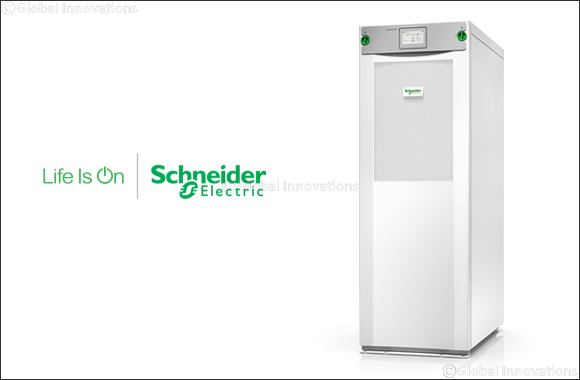 Dubai, UAE, April 14, 2019: Schneider Electric, the leader in digital transformation of energy management and automation, today introduced the Galaxy VS, a highly efficient, modular, easy-to-deploy, 10-100 kW, three-phase Uninterruptible Power Supply (UPS) designed to meet the critical power requirements of IT, commercial, and industrial facilities. Cost savings: Provides up to 99% efficiency when operated in Schneider's patented ECOnversion mode. The Galaxy VS, which has a wide power range from 20 kW to 100 kW (400V & 480V) and 10-50 kW (208V) with one global platform, is now available worldwide through Schneider Electric and its partners.